I have an unbearable obsession with candles. I seriously can't get enough ... they can be found all over my apartment, from my bathroom windowsill to my nightstand to my kitchen to my living room to my ... okay, you get the point. But with that being said, it actually takes a lot for a candle to make its way into my home. It has to smell incredible without feeling cloying or heavy, permeate the space without sticking around too long, and generally leave me in a state of bliss. A pretty tall order for a little jar, wouldn't you say? Well, the Laura Mercier Sugar Cookie Candle does just that. This was a limited-edition candle from the holiday season that I was lucky enough to snag during Laura Mercier's recent Grab Bag Event. And wow, am I ever glad I did! First of all, the packaging is among the most gorgeous I've seen yet. 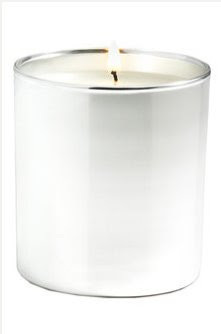 A large, gleaming silver tin contains a candle of deliciously scented creamy wax and looks beautiful atop the vanity. And every time I light the wick, an intoxicating mix of sugar cookie, coconut, vanilla and cherry notes waft out of the tin so deliciously, I have to stop myself from diving in and eating the candle up! Luckily, the candle has a 40-50 hour burn time, so I'll be able to enjoy the scent for awhile. Unfortunately this candle has sold out, but hopefully it will be brought back this holiday season! I have that problem with the Laura Mercer shower gels too. They smell so good, you just want to eat them!